	Hasheem Thabeet's value comes from his defensive ability, but the development of his offensive game will be integral to his success in the long-term and determine how he is viewed as a player. Thabeet is going to block shots next year, pull down some rebounds, and face an uphill battle to become a bigger offensive threat than he already is. Before we look at the difficulties he may face, we first need to take a step back and observe how Thabeet's role has grown over time on paper. In his first season under Jim Calhoun, he got only 1.3 possessions per game in post up situations (25% of his total offense), and almost one-third of his touches off of basket cuts. This past season, he got nearly 35.1% of his touches on the block, a dramatic improvement from his first season. After almost exclusively earning his touches on hustle plays as a freshman, Thabeet put up 1.08 PPP in 4.1 post up touches per game as a junior, ranking him first on our list in PPP and showing how significantly he improved from his sophomore year (.76 PPP). Obviously, Thabeet grew as a player during his time at Conneticut to the point that he was a viable offensive option this season, but that doesn't necessarily mean that he's going to do much scoring in the NBA. There are a number of reasons to be skeptical about Thabeet's ability to score on the NBA level. First, he got only 11.8 possessions per-game on the offensive end this season, 5.4 of which came on catch and finish opportunities off of offensive rebounds, cuts, or otherwise. His total touches would rank him second to last amongst our power forward group and in the middle of the pack amongst our centers. He shot 73% on his finishing opportunities, using his size effectively and dunking anything he could, and also shows some ability to get up the floor and make some small contributions in transition. Nearly all of Thabeet's touches came within 5 feet of the rim, as evidenced by the fact that he only took 14 jumpers all season. His 1.08 PPP on the block was better than any player we looked at with the exception of DaJuan Blair, but his 4.1 touches was below average for a center. Obviously Thabeet did a solid job getting more touches as time went on, but he's still didn't generate many scoring chances as a senior in comparison to the players he's competing with for draft position. Its more than a bit concerning that Thabeet was already having trouble making his presence felt on the offensive end on the NCAA, however efficient he may have been. He was after all, essentially a giant in a land of midgets. He won't have anywhere near as big a physical advantage in the NBA as he did in college, which will make things even more difficult on him moving forward. Thabeet struggles badly trying to create opportunities for himself, being incredibly reliant on the talent and generosity of his teammates to generate offense for him. When he was able to get the ball in scoring position, though, he was a major force. Thabeet scored a point on 62.7% of his half court offensive touches, ranking him first amongst all players we looked at. The problem is that he received such few touches, his 11.8 possessions would place him 25th amongst the power forwards we previously examined. Considering how obvious his presence is on the court, you have to think that if his coaching staff and teammates saw him as a viable offensive option, he would have received far more touches this past season than he actually didsince obviously everyone involved was looking to win as many games as possible. Subjectively speaking, it wasn't rare to see Thabeet become very passive on the court and only half-heartedly look for the ball. On top of that, his passing rate was very poor, the lowest in this group, and many potential possessions never even materialized due to his inability to make clean catches, leading to turnovers for others. It's not a stretch to say that his teammates did not have enough confidence in his offensive skill-level to get him the ball in the half-court. Hasheem Thabeet got off to an excellent start this season, as he's increased his production and efficiency across the board, but he's probably hoping his matchup with Georgetown and freshman Greg Monroe is not a sign of things to come for the rest of the Big East season. In his worst offensive performance this season, Thabeet scored just 4 points on 4 field goal attempts, being completely neutralized by Georgetown's aggressive defense, which took both Thabeet and UConn's point guards out of their element. Nothing came easy for Thabeet in the game, as he was in a constant battle for positioning in the post, where Greg Monroe, Julian Vaughn, and Dajuan Summers used their leverage to body him away from the basket on many occasions, keeping him from getting comfortable in areas where he can catch and score. When the ball did come to Thabeet, Georgetown blanketed him, while he struggled to make quick decisions with the ball and looked extremely tentative, leading to a few awkward possessions. With a very high center of gravity, along with below average balance and coordination (it's worth noting Thabeet has improved tremendously in these two areas over the past two seasons, and he's likely to continue improving there in the future), Thabeet doesn't have the easiest time getting leverage on post battles, and can be pushed off the block by shorter, thicker opponents who aren't afraid to get physical. Combine this with some weakside swiping by Georgetown's guards when Thabeet did receive the ball, and it put Thabeet in a situation where he wasn't able to do very much. It'll be interesting to see if the other Big East teams try and emulate this strategy (Arinze Onuaku and Samardo Samuels are capable of similar physicality in the post), and if so, how Thabeet will adjust to it. Looking away from this specific game, which obviously is not an accurate indicator of Thabeet's progress alone, there is much to be impressed with in the early going this season. His points per 40 minutes pace adjusted are up from 13.0 to 18.4, while his TS% rose from 64% to 68%, and you can look to a few things for reasons why. The competition level in non-conference play of course has to be mentioned, especially with Thabeet scoring more than 9 points in only one of his four big matchups thus far (19 points vs Miami along with 9 vs Wisconsin, 9 vs Gonzaga, 4 vs Georgetown). That's definitely not the only reason, though, as watching his game, a few things stand out. In the post, Thabeet is looking more comfortable with his back-to-the-basket, and while he still doesn't really have a go-to move, his mini right-handed hook off his left shoulder is getting there. He's also faking right shoulder at times, showing semblances of counter-moves, and in a recent matchup against Fairfield, he converted on a left-handed hook from 5 feet out, something to possibly look out for in the future. As was the case against Georgetown, however, Thabeet looks considerably less comfortable against physical defenders, especially ones with size and athleticism. In these matchups, his post-up moves look a little more rushed, and his effectiveness drops. Thabeet's still at his best catching and finishing off cuts, getting open in the halfcourt and in transition. While he's done a pretty good job of it this year, Thabeet still has instances where he doesn't look instinctive on these plays, not being decisive to finish strong as soon as he gets the ball, which can lead to missed opportunities. On the defensive end, despite his blocks per 40 minutes pace adjusted going down in each of his three seasons at UConn, it's hard to argue that he's improving on this end, as it's also important to mention how his fouls per 40 minutes pace adjusted have also gone down. Also, in actually analyzing the tape, Thabeet's awareness and hand-eye coordination definitely appear improved with his shot-blocking, both in man and help situations, however his reaction speed is still lacking at times, which isn't so much an issue against most college opponents, where his length and size allow him to recover. In man-to-man defense, Thabeet still has some major problems, however, specifically on the perimeter, where his high center of gravity and lack of balance disallow him from getting into proper defensive stance and moving laterally, leaving him highly vulnerable to face-up players. His length allows him to recover from behind on drives at times, but this won't be as reliable of a bail out for him at the next level. In the post, Thabeet can get pushed back with his lack of leverage, however he usually plays fairly smart these days, relying on his length and size and forcing opponents to shoot over him. He struggles with quick lateral movements, though. Looking forward, Thabeet is still a likely lottery pick if he decides to declare and continues with his strong production, however more games like this one against Georgetown are certainly not going to help him in the eyes of NBA scouts. Thabeet enters the season as the Big Easts top draft prospect after showing outstanding improvement between his freshman and sophomore campaigns. The package of size, athleticism, and increased productivity that he showed in his second season established him as one of the top center prospects in the NCAA, despite his limited offensive game. 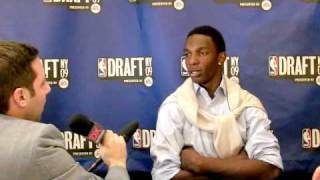 The biggest asset that Thabeet offers is a prospect is easily the sheer physical package that he offers. Looking every bit of 73, he possesses a huge wingspan and a frame that could easily add another 20 to 30 pounds if so desired. Although appearing quite awkward running the floor, he has shown the ability to beat opposing big men in the Big East up and down the floor on a consistent basis. Equally as impressive is his ability to explode off the ground from a static position, looking to dunk everything he can when he gets the ball around the cup. The Tanzanian native is still far from a finished product on the offensive end, although he did make strides as the season went on. The problems that he had in terms of catching the ball and playing a bit too upright are still a concern, however there was a considerable amount of improvement in both of these areas last season. Attempting only 5.7 shots per game and not owning a vast repertoire of post moves, its clear that he cannot be relied upon as a consistent scoring threat at this point in his career. Thabeets raw footwork, inability to read double teams and lack of a consistent go to move hinder his development as a legit scoring threat. Likewise, he has proven to be a very poor passer out of the pivot, making him very vulnerable to being blitzed when he touches the ball down low. However, the big man did show flashes of improvement as the year went on. Thabeets confidence on the offensive end really seemed to skyrocket towards the conclusion of the season, where he showed the ability to finish around the rim with both hands while absorbing contact. He showed flashes of a developing jump hook with either hand, even with the limited touch he possesses on the offensive end. More importantly, he did a much better job of simply catching and finishing around the rim and even improved his free throw percentage by over 18% in between his freshman and sophomore seasons. Defensively, Thabeet has already shown the ability to completely change the game with his shot blocking presence. He rotates quite well and is able to take up a ton of space in the paint with his mammoth size. Equally as impressive is his ability to swat shots away without committing a large number of fouls, averaging only 2.6 fouls per game as a sophomore. The potential impact that he can have on this end of the floor is unparalleled by any prospect entering the draft since Greg Oden came around in 2007. While he is a game changing presence as a shot blocker, he is a relatively poor man to man defender. His lack of lower body strength and tendency to play completely upright severely hinder him in this area, where he has proven to be outmuscled by much smaller players. He struggles badly trying to step out and on the perimeter, showing extremely poor lateral quickness that was exposed most noticeably in the repeated pick and pop plays that San Diego ran en route to upsetting UConn in the first round of the NCAA tournament. Thabeets lack of core strength also hurts him in terms of rebounding, where he is often pushed under the basket by hard working big men. It will be interesting to see how much work he was willing to put into these areas over the summer, as there were some question marks about his work ethic early on in his career. Thabeet will have every opportunity to jump to the NBA this season if desires to do so. Improvement offensively and stepping up his man to man defense would only solidify his position as a mid lottery pick, potentially rising even higher depending upon who is slotted towards the top of the draft. The dismissal of Nate Miles will certainly open up more scoring opportunities for Thabeet, who practically controls his own destiny with how hard hes willing to work on the floor in this third season at the NCAA ranks. Its been an up and down season for UConn sophomore Hasheem Thabeet so far, with plenty of highs and lows individually, mixed in with a good amount of success his team has enjoyed lately. Thabeet has noticeably improved on the offensive end, pushing his points per-40 minute pace adjusted averages from a dismal 9.8 to 14.2 currently. That still puts him just 77th amongst the 84 NCAA players ranked on our 2008 or 2009 mock drafts, but its a clear improvement over last year, when he was second to last. Hes also shooting the ball at a better clip from the field, 63% compared to 55% last year. Unfortunately, Thabeets rebounding, assists, and blocked-shots have all decreased per-40 minutes when taking his extra playing time into account so far, although he is turning the ball over less and committing fewer fouls. Very notable has been the significant improvement hes shown from the free throw line, from 51 to 70.5%. The points hes no longer leaving at the charity stripe in fact account for nearly half of his added scoring output this year. Regardless of his statistical output, any intrigue around Thabeet as an NBA draft prospect starts and ends for the most part with his physical tools, which are nothing short of amazing considering how rare of a class hes in. Standing 7-3, with a phenomenal frame that should be able to carry significantly more weight, a terrific wingspan, huge hands, and excellent mobility relative to his size, Thabeet looks the part of future defensive stopper and then some on first glance. He gets up and down the floor awkwardly (almost with a strange limp), but clearly has solid mobility (especially getting out in transition), and is especially impressive getting off his feet to finish plays or challenge shots in the lane. Offensively, Thabeet is for the most part limited to within five feet of the basket. He can really overpower smaller opponents by establishing deep position in the paint and using his size and length to make his presence felt from close range, sometimes with a ferocious dunk. His hands look better than they were last year, but hell still fumble the occasional pass or just have balls deflect right off his palm after not being able to react in time. Hes getting out and running with his guards fairly impressive on fast-breaks on occasion, and has been on the receiving end of a couple of highlight reel caliber alleyoop plays. Once taken out of his comfort zone offensively, (meaning catching and finishing for the most part), Thabeets inexperience as a basketball player really comes out. His footwork is poor, and hes fairly slow and mechanical trying to create any type of offense for himself if he needs to make a real move. He also lacks a left hand or any type of counter moves, often just throwing the ball up on the rim with poor touch, hoping it drops. He clearly lacks core strength and especially balance here, falling over on the floor quite easily and looking somewhat fragile in general if forced to react to something unexpected out on the court. Hes also an extremely poor passer, currently tied for having the second worst assist rate in the country amongst all players in our database, and also ranking near the bottom in assist to turnover ratio. Considering the lack of polish he shows on the offensive end, its not a stretch to say that hes probably never going to be much of an option here in the NBA. Defensively, though, Thabeets potential as a game-changer inside the paint is hard to ignore. He has excellent timing for blocked shots, and has started get better at keeping the ball in-bounds after a block. His mere presence in the paint is a huge deterrence for opposing teams at this level, as hes not only 7-3, but also exceptionally long, and capable of getting off his feet. He makes a big impact in the paint as far as team defense goes, ranking 7th in the country in blocks per-40 minutes pace adjusted. As a man to man defender, Thabeet leaves something to be desired still. Skilled back to the basket centers (a rare commodity in the NCAA) have proven to be very effective against him, as he gets pushed around and posted up quite easily, not looking to fight back that much, standing too upright, giving up excessive space, and not moving his feet very well to stay with them. He does a very poor job in particular of stepping out onto the perimeter to hedge a screen or defend a big man who is capable of facing the basket, showing poor awareness in space and looking fairly lost in the process. Nowhere was that more evident than in the Georgetown game a few weeks ago, where Thabeet lost his man Roy Hibbert completely and thus gave him a great deal of time to set his feet and knock down the game winning 3-pointer from behind the arc. Big matchups in general have been a problem for Thabeet over the last two years, as every time he faces a team with anything even resembling an NBA caliber big man, he struggles badly. Rebounding-wise, youd probably expect Thabeet to make more of an impact than he currently does considering his awesome physical tools. He in fact ranks just 47th of the 56 NCAA centers that are in our database in this category per 40 minutes pace adjusted, despite standing 7-3. His poor hands are most evident in this part of his game, as are his lack of fundamentals--boxing out his man lackadaisically, and going after rebounds with just one hand. Hell often take himself out of position for rebounds by chasing blocked shots excessively, which further hurts him in this category. Another problem here is that Thabeet doesnt seem to be the most active player in the world, rarely going out of his area for rebounds, and not really showing the type of fire and passion you see out of players who just want the ball more than their opponents. At times you get the feeling that Thabeet is not going 100%, as hell look sleepy, distant, and not involved in whats going on on the floor. There have been question marks raised constantly regarding his motor, work ethic and love for the game, which is a huge concern considering how far off he is at the moment from reaching his full potential, and how much individual work hell have to put in to get there. With that said, Thabeet seems to be making some clear strides as a player this year, and obviously has a lot more room to grow. Hell be tempted to enter the draft this year already and possibly cash in on being selected somewhere in the first round, but would clearly benefit long-term from being patient and spending another year in college under Coach Calhoun, who has a sparkling reputation for developing NBA big men. The Tanzanian big man looked just as raw in Akron as he did throughout his freshman season at UCONN on the offensive end, looking puzzled as to what to do the ball each and every time he touched it. Surprisingly, his hands were noticeably worse then they were at UCONN, with Thabeet bobbling just about every single pass he received. It should be noted that his left hand was heavily taped earlier in the day, suggesting some sort of possible injury. Either way, it was clear that Hasheem was quite a ways behind both of the Lopez twins in terms of productivity on both ends of the floor, and has a lot of work to do before he should consider entering the NBA Draft. One of the more disturbing cases considering the magnitude of his decision as far as his long-term development goes, were receiving strong indications from numerous sources that UConn's freshman Hasheem Thabeet is seriously considering entering the draft. This has all the makings of a potential disaster, eerily reminiscent to another highly regarded Big East prospect a few years ago--Chris Taft. Compared to Tyrus Thomas, and billed as "an athletic Mutombo" by a preseason article written by Andy Katz, Thabeet has been blocking shots at a nice rate, but everything else about him so far has been a massive disappointment. He's cracked double-digits in the scoring column just five times this season thus far--against Fairfield, Albany, Pepperdine, Coppin State and St. John's--and has used his massive 7-3 frame to pull down 10 rebounds just four times, again against the weakest competition UConn has faced. Defensively, beyond his shot-blocking, Thabeet has been lit up by every (even marginal) NBA prospect he's gone up against, whether its giving up 13 points and 10 rebounds to an equally raw freshman in Omar Samham (St. Mary's); 19 points, 11 rebounds to Herbert Hill (Providence); 19 points, 11 rebounds to David Padgett (Louisville); 21 points to DJ White (Indiana); or 22 points, 19 rebounds to Aaron Gray (Pitt). Offensively, we've seen little to no progress since the beginning of the season. Thabeet still shoots the ball from the back of his hand, still doesn't understand how to properly bend his knees and go up for a simple dunk, is not able to palm the ball despite having very big hands, and is almost incapable of catching a post-entry pass due to his poor hands and non-existent reaction time. At this point, considering the way he looks, it's safe to say that hes light years away from being able to contribute anything on this end of the floor. Most people would tell you that's fine, because Thabeet is 7-3, has a very good frame, and moves better than 98% of the 7-footers we've evaluated...meaning he has a very good upside. Saer Sene was drafted 10th! they say, not realizing the difference between last years draft class and this one, while also failing to take into consideration the stark differences between the two players as far as their work ethic and attitudes are concerned. The fact that he has a huge upside is probably true, but at the same time, we have to consider just what the likelihood is of Thabeet ever actually reaching his ceiling and achieving that upside, which is just as important a part of the equation, particularly if hes to rot on an NBA bench for the next four years. That probability of reaching said upside takes a significant nose dive when you actually watch him play, look at the way he carries himself on the floor, and talk to people who have spent time watching him practice. Thabeet seems to have little to no interest in using his size and strength to help his team as a rebounder, not playing with much energy, refusing to get dirty and go after loose balls, and displaying a very low basketball IQ in everything to do with his anticipation skills. In practice, people who have watched him have come away with the impression that Thabeet is not a hard worker at all. He makes faces when asked to do extra work, and generally acts like he's being punished by being required to do crucial drills for his development that other players don't participate in. This lack of a high-energy motor and work ethic is usually the kiss of death for a player who is as raw as he is. He will need years of individual work before anything can be expected from him at the NBA level. Once teams find out what we're learning, if they haven't already, it can be more than enough to drop a player like him into the second round. Contrary to popular opinion, the NBA is not nearly as interested in developing raw talent from scratch as many would lead you to believe, as the coaching staff just doesnt have time to teach the fundamentals of the game during a grueling 82 game season. Usually we would not go out of our way to blast a freshman who clearly came into college with the billing of a project, having only played basketball for a few years. The thing is: we feel that considering the unaccountable hype around him--currently projected as the #6 pick in the 2007 draft by nbadraft.net and the 16th best prospect by ESPN's Chad Fordthere needs to be another side out there to put things in proper perspective. Players, families, AAU coaches and agents process all this information and often act on it without being able to find anyone thats able to give them a second opinion (NBA people are generally not interested in taking part in this process), but when disaster strikes, the player will have to pick the pieces up by himself while outlets like ours move onto the next batch of prospects. Chris Taft was rated similarly by the same exact people at this point in the season two years ago (ourselves included). He ended up going in the mid-second round and is currently out of the NBA. Whats sad is that Thabeet is actually contemplating making a selfless decision that has just as much to do with his family situation as it does with himself. His mother and siblings are still in Tanzania, and his father passed away just a few years ago. Its a difficult decision indeed for a teenager to make, especially with the lure of so much money looking so close. The question is: how much in long-term earnings will he be losing by leaving so early? No one can say that for sure, and plenty depends on Thabeets internal motivation. Or, if people put the notion in his head because he's 7-foot-3, he'll sit [on] the bench [in the NBA], he'll never make a second contract, and never make any money in his life. So, hopefully, the right people get hold of him and be intelligent." Thabeet generally showed how far off he is, but the flashes of potential he displays are still downright staggering. He is already running the floor much better than he did early in the season, and is improving his mental awareness slowly but surely. The one area where he is furthest along is on the glass, where he does a solid job of sealing his man and corrals just about anything in sight with ease. When he reacts naturally on the defensive end, the results are scary. However, he still doesn't use his length to its full potential - oftentimes opponents can get the ball over his arms by shooting it quickly, due to that slow reaction time. Offensively, Thabeet is well behind the curve. If it isn't a layup or dunk, Thabeet probably shouldn't be shooting it at this point. Nonetheless, it is hard not to get caught up in what Thabeet could become if he continues to develop as a player. At the same time, Samhan is a youngster worth keeping an eye on. Players this young and this big are rarely this far along skill-wise.